bdonns aka brando aka donns imus is back in town..i am commemorating the moment by sharing one of my prized possessions with all of you. 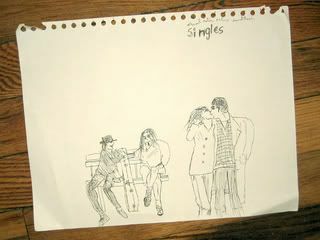 a page out of his sketch book from 1992, the SINGLES SOUNDTRACK ART, rendered brilliantly by a TEN YEAR OLD B. DONNELLY. clearly a prodigy and future man after my own heart. this is out of control amazing. i mean, wtf.